La Jolla Real estate mogul Marc Paskin won’t be getting a visit from Santa this year. The desperate plea for affection didn’t go over too well with some residents as reports state the day after it went up someone (most likely kids) vandalized the billboard by tearing off Paskin’s email address. His luck to find a mate ran out, as by the weekend, the entire message was gone. There’s no word yet on who’s responsible for vandalizing the billboard, whether or not Paskin will replace it or if he did find a girlfriend. 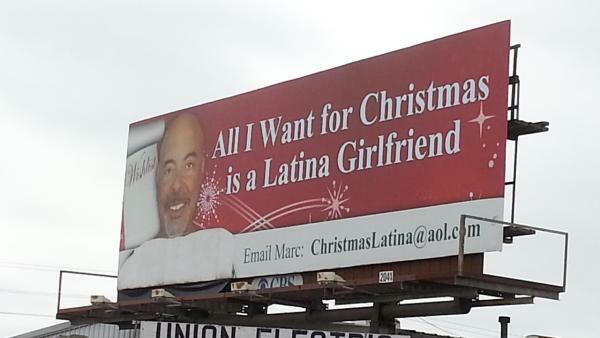 Posted in GOSSIP, NEWSTagged Billboard, girlfriend, Hypealertmedia, la jolla, Marc Paskin, Millionaire, Millionaire's "Latina Girlfriend" Billboard RemovedBookmark the permalink.